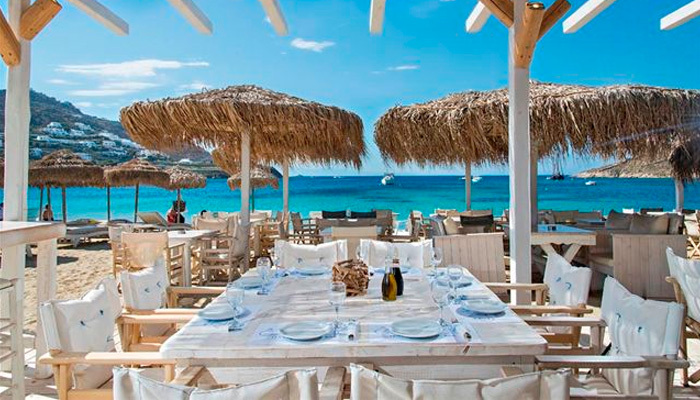 Aperanto Galazio in Mykonos is an all-day beach bar in Ornos Beach in Ornos with Greek cuisine and Mediterranean flavors. Start your day enjoying excellent quality coffee, made with care by the experienced baristas at the beach bar and combine diving in the beautiful waters of Ornos beach for complete relaxation. The menu is special and includes fresh local meats, fine fish and seafood. Try fresh grilled salmon, lobster, baked potatoes, pasta, risotto, chicken fillet and juicy burgers. In an idyllic setting with white colors and exotic decoration, you will be able to discover an unforgettable summer experience with a nice meal by the sea of Mykonos.